I got some great drawings. The very sharp Maggie wants to go to China more than anything. 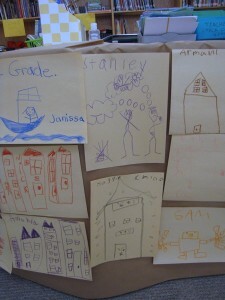 Janissa wants to sail on a boat, Stanley wants people to think about butterflies and sunshine instead of negativity (no joke), and Sam wants robots. One of my first graders, Elijah, wants to be the CEO of Wal-Mart one day. His older brother Omar tells me he makes up business cards and even recruited a little girl at church to be his secretary (his picture isn’t up here). I love all of their stories. This was just the first week, but it was a big one. Then we read Ladybug Girl by Jacky Davis and David Soman. We talked about times when we’ve felt bored, too little to play with our older siblings, or ignored when our parents are busy. We talked about making our own fun, and all the ways Lulu used her imagination to fill up her day. They loved it, they all had stories about feeling just like she did. And then we spent two weeks on Where the Wild Things Are. First we read the book, then we talked about how Max uses his imagination and deals with his feelings. I mentioned in my post about the movie that the first graders really got this book. 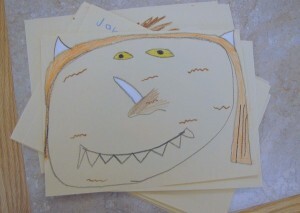 After we read the book we made these phenomenal Wild Thing masks (the 2nd and 3rd photos here). My original plan was to cut out the masks, glue them to popsicles, and have a “wild rumpus” party in the library this week for October Game Days. I had to rethink that plan after seeing just how amped up these munchkins are the week before Halloween. My week has involved keeping them from climbing the furniture and howling to the rafters. 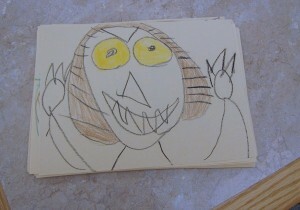 So I kind of thought having a wild rumpus this week would be disastrous and possibly even dangerous. I mean, these kids are seriously climbing the walls, and I don’t need to set them loose and make it worse. Next week I have 2 classes in before Teachers’ Convention, and I may attempt a post-Halloween rumpus. But how cool are their masks? I loved this unit.